Colonel Christopher Billopp was a leading citizen of Staten Island and served as head of the Staten Island militia. He led the opposition urging Staten Islanders to vote against joining the Provincial Assembly. The majority of Staten Islanders were loyal to the King of England and, in fact, welcomed British soldiers when they arrived on their shores on July 4, 1776. On July 9, 1776, nearly all adult males signed an oath of loyalty to the king. Nine thousand British soldiers camped on Staten Island, a number that swelled to nearly twenty thousand when a second wave of soldiers including the Hessians and other mercenaries arrived. The 6th Brigade of approximately 1,200 men camped near Billopp’s Ferry at the end of Amboy Road, Tottenville. During this period the Billopp manor house was used as a barracks by Hessian soldiers and others. The Conference House (formerly Billopp House), built circa 1680, is named for the peace conference that was held there on September 11, 1776. The conference was unsuccessful and the war continued. Although no major battles were fought on Staten Island during this period, a notable skirmish took place in nearby Rossville (formerly Blazing Star) in 1777. A cannon used during that conflict, which had been donated to Conference House Park, was stolen from the park in 1972, and has never been recovered. Any information pertaining to the cannon's whereabouts will be greatly appreciated. 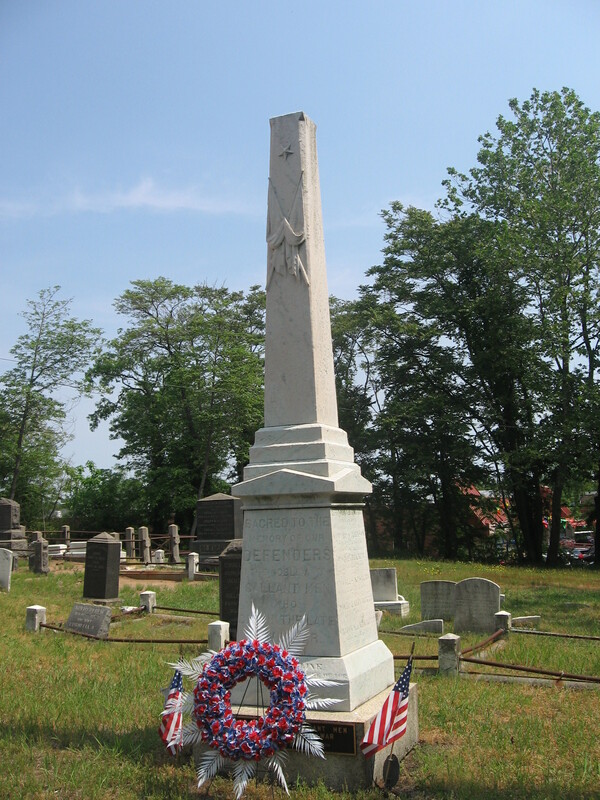 Located in Bethel UM Church Cemetery, Tottenville, is the gravesite of Joseph W. Palmer, a Revolutionary War soldier. Palmer, a Tottenville resident served with a New Jersey Regiment. He suffered a musket ball injury that ultimately led to his death in 1851. The post was named in honor of Naval chaplain John L. Lenhart, Tottenville resident, who drowned aboard the USS Cumberland during the historic battle at Hampton Roads, VA in 1862. Lenhart was the first naval chaplain to die in service to this country. A monument to his memory was erected in Bethel Cemetery, Tottenville. The Lenhart Post disbanded in 1924. The soldiers’ names inscribed on the base of the Bethel monument are: Philip A. Joline; John Stevens; Rev. John L. Lenhart, chaplain U.S.N. ; Cornelius M. Sprague; Albert A. Johnson; David M. Bartine; John J. Decker; Daniel Simonson; Charles Newbury; Daniel Lyons; David Latourette; David J. Sprague; William M. Latourette; John McNamara; Duncan Carr; Richard Laforge; Cornelius Dissosway. Pvt. Joseph S. Decker, Co. I, 71st Regt., a resident of Tottenville, was the only Staten Islander killed in the war with Spain. A grand parade in his honor took place in February 1899. His body lay in state in the former Edgewater Village Hall Stapleton. Interment took place at Bethel Cemetery, Tottenville, where in 1912, a ceremony and monument unveiling was held. The first local draft board on Staten Island opened on May 25, 1917. Richmond County sent more men to the war effort per capita than any other county in the United States. Of the 5,000 Islanders who served, 141 were killed. Sergeant John W. O'Meara, Jr.
During World War II, many towns across America erected wooden memorials to honor the local servicemen and women. In Tottenville, a large, billboard-sized Honor Roll plaque was located on Main St. across from the Stadium Theater. In Charleston, a similar plaque was erected on Arthur Kill Rd. near Sharrotts Rd. Most of these plaques were made of plywood and did not last long. The whereabouts of both local monuments is uncertain today. The 100 Club of Staten Island sponsored the Honor Roll Plaque in Tottenville. It was dedicated on September 19, 1942 and contained 352 names. A later photo recorded more than 750 names. Frank Kelly served as President of The 100 Club and Honorary Chairman of the Honor Roll Plaque Committee; Claude B. Gandy, Commander of the American Legion Beauvais Post, was the Committee's General Chairman. John Youngberg and Julius DelGrosso meticulously painted the plaque and lettering. Youngberg also created an oil painting of the plaque (below). World War II - Korean Conflict - Vietnam Conflict. By 1969, there were 540,000 American troops in South Vietnam. It was not until March 1973 that the last U.S. ground troops came home. The death toll numbers about 58,000; an additional 1,800 were classified as missing in action. The Vietnam War era was a time of great social upheaval. It was also the first foreign war where U.S. combat forces failed to accomplish their goals. This hurt the pride of a lot of Americans and left painful memories. In November 2008, during a solemn ceremony, a monument was dedicated at Tottenville High School for the former students who lost their lives during military service. It's never too late to remember.